Are there any papers that expand on "the worry that short term heating can cause feedbacks"? You should also look at it carefully, I reckon the numbers in the paper aren't big enough to match the general feedback=doom theme. It is my opinion that consensus climate scientists do not adequately account for the dynamical/periodic climate attractor associated with the on-going synergy between such Earth Systems as: the bipolar seesaw, ice-climate feedback, ENSO trends/cycles, cloud feedback, polar amplification Hadley cell expansion and precipitation patterns. For example, an acceleration of ice mass loss from Jakobshavn thru 2028 would contribute to the North Atlantic cold spot (regardless of possible increased net snowfall on Greenland in this timeframe); which will serve to somewhat slow the MOC, which in turn will increase the absorption of heat by the tropical oceans, and thus will contribute somewhat to increased extreme ENSO events. Also, Proistosescu & Huybers (2017), PH17, has demonstrated, using CMIP5 output, that a slow response feedback associated with the ocean heat content of the Tropical Pacific and the Southern Ocean has already been building since 1750 and is now contributing to ECS. This can be seen directly in the first & second images, and indirectly in the middle panel of the third image (from Andrew's 2015 Ringberg presentation), and in the red 'time-dependence' curve of the forth image (which supports a mean ECS value of 4.5 when the considered time dependent feedbacks have kicked in) from Amour (2016). Title: "Guest post: Why BECCS might not produce ‘negative’ emissions after all"
Extract: "In our new study, published in Nature Communications, my colleagues and I find that expansion of bioenergy in order to meet the 1.5C limit could cause net losses in carbon from the land surface. Instead, we find that protecting and expanding forests could be more effective options for meeting the Paris Agreement." Title: "Guest post: Six key policy challenges to achieving ‘negative emissions’ with BECCS"
Extract: "Biomass energy with carbon capture and storage (BECCS) features as a key technology for delivering the Paris Agreement on climate change. It is included in many pathways developed using integrated assessment models (IAMs)." Thus, it seems to me that with the limited will power that global policymakers seem to be able to muster, it seems advisable to be to spend our limited willpower to first restrict methane emissions and then to tackle the very real problem of carbon dioxide missions." Edit: Regarding the limited collective willpower of policymaker I note that Australia recently announced its proposed plan to withdraw from the Paris Agreement. Before this thread wanders too far off, I'd like to tie up a few loose ends. First, earlier I posted a comparison of the recent (2012-present) forcings from each of the major well-mixed greenhouse gases (WMGHGs), from each of the CMIP5 scenarios and also from observations (via NOAA AGGI). * Yes, the calculations were done correctly. * No, there was no change in how stratospherically adjusted RF was calculated between AR4 and AR5. * No, we do not need to worry about using stratospherically adjusted RF vs effective RF (ERF) because for the WMGHGs shown here, the values are effectively (pun not intended) identical. * No, we do not need to worry about the distinction between emissions-based and abundance-based forcings because both are valid for their own purposes and in this thread (focused on climate science rather than climate policy) I'm being consistent about using abundance-based forcings (as is standard in the literature that this thread is based on). OK, with all that out of the way. There is one improvement that could be made, which is to update the forcing calculations based on Etminan et al. 2016. I did this for the graphs on the first page of the thread, but not for this latter one. As with the earlier version of this graph, it appears that RCP 8.5 has been overestimating the CH4 (and CO2) forcings, while the other scenarios have been underestimating them. The CH4-to-CO2 ratio is 0.11 for the observations (i.e., CH4 forcing is "currently" about 11% as large as CO2 forcing). Upon further reflection I think describing this as "fairly small" would be reasonable, but the phrase I used in the second post of this thread ("basically trivial") is not appropriate. CH4 forcing is "small" but not "trivial" compared to CO2, and it will probably grow in the future. Obviously, there are no observations for the future (yet). If the real world ends up somewhere between RCP 4.5 and 8.5 (as it is now) that would mean the CH4:CO2 ratio would be somewhere between 0.01 and 0.22 -- a pretty wide range of possibilities. It's important to keep in mind that the CMIP5 scenarios are simply "concentration pathways" not process models. The committee picked one case that has very high concentrations (8.5) and then some others with differing combinations of lower concentrations (the others). What this means is that it's not appropriate to, say, take the results of a new paper (e.g., the Katy Walter Anthony one) and somehow "add" it to RCP 8.5, on the assumption that RCP 8.5 contained a distinct set of processes and the KWA one is a new, additional one that needs to be added in. That is not how the RCPs work. Having said that, I would remind us all that as a rough comparison, the increase in forcing from CH4 emissions from thermokarst lakes according to the KWA paper works out to (roughly) 1% of the total forcing (for the same time period) under RCP 8.5 (see the first page of this thread for details). CO2 forcing from thermokarsts adds a little more, but the total effect is still small. Keep in mind, everyone, that just as the CH4 forcing is fairly small compared to the CO2 forcing globally, the Arctic CH4 forcing is fairly small compared to the global CH4 forcing. Thanks for your patience (if anyone bothered to make it through all those words). Thaks for doing the Etminan calcs. Thank you Ned for the summary. I will just add that I dislike the wording used in the last post. In my layman view, forcing is how much the Earth's energy balance is out of equilibrium - this is what drives AGW, and added forcing is how much this out-of-balance situation is changing over time - this accelerates AGW. I understand that in the scientific terminology the change in forcing is also called forcing. But a layman would be confused by it. So IMHO, the 2012-2017 RF chart is showing something interesting - that CO2 is the accelerator of AGW. BUT - it is also hiding something that shouldn't be hidden - that current abundance of CH4 does have a siginificant contribution to AGW, and that reducing this abundance would slow down AGW. CH4's short residence time in the atmosphere makes this an important point, that I think should be mentioned when you summarize the subject, especially after a few people felt that the discussion was minimizing CH4. If I were to light a huge lamp pointed at the earth, its climate forcing would be huge, but in your charts it would be zero as there is no annual change. IMHO, not properly presented. IMHO, your summary should also show RF 2017-1750. Thanks, Oren, for your comments. I think most of what you're saying here basically can be summarized as "answers to a different question". In my layman view, forcing is how much the Earth's energy balance is out of equilibrium - this is what drives AGW, and added forcing is how much this out-of-balance situation is changing over time - this accelerates AGW. One problem with that is that the Earth doesn't have a single "equilibrium". When there is an externally forced change -- people add CO2, the sun gets brighter, whatever -- the system slowly adjusts to compensate for it, until the Earth reaches a new equilibrium at a higher (or lower) temperature. I understand that in the scientific terminology the change in forcing is also called forcing. But a layman would be confused by it. There is no difference between what you are calling a "forcing" and a "change in forcing". A forcing is simply the difference in the Earth's radiative climate between two different sets of conditions. Those conditions can be further apart or more similar, whatever you are trying to compare. I believe that a large number of people here on ASIF have trouble with that idea, at a gut level. This exact same thing came up one year ago this week, when Jai Mitchell was angry at me for talking about forcing using something other than 1750 as the baseline. The change in radiative balance from CO2=280ppm to CO2=410ppm conditions is a forcing. The change from 400 to 410 conditions is also a forcing. There is no difference at all conceptually, just one is bigger than the other. So ... I understand what you are describing as the "layman's" concept of forcing. But it's not how scientists use forcing. And if we are going to be using data from scientists and talking about papers written by scientists, it's probably a good idea to start using the terms the way they do. So IMHO, the 2012-2017 RF chart is showing something interesting - that CO2 is the accelerator of AGW. BUT - it is also hiding something that shouldn't be hidden - that current abundance of CH4 does have a siginificant contribution to AGW, and that reducing this abundance would slow down AGW. I understand the point you're trying to make. I just think it is an answer to a different question ("how could we efficiently reduce or reverse warming in the future?"). Yes, we could reduce atmospheric methane in the future and create a negative forcing. But the fact that we aren't doing so right now doesn't make it a positive forcing at the present time. There are a vast (infinite?) number of things we could do in the future to force the climate one way or another. But we don't count "not doing X" as creating an anti-X forcing. Circa 2000ish, human emissions of CH4 plus natural feedbacks were in a relatively "steady state" where each year's emissions exactly compensated for each year's natural breakdown of prior emissions. Adding more would create a positive forcing, reducing it would create a negative forcing. Staying the same ... represents zero forcing. CH4's short residence time in the atmosphere makes this an important point, that I think should be mentioned when you summarize the subject, especially after a few people felt that the discussion was minimizing CH4. I think that's a different point, one that is of great relevance to the question of how to "undo" the warming we've done or avoid crossing some future threshold. It's not directly relevant to the question of what's responsible for current warming. As an example: I am not recommending this, but assume for the sake of argument that we could reduce the temperature by manufacturing a large volume of styrofoam pellets and covering the ocean with them, to reduce its albedo. I wouldn't say that the fact that we aren't doing that means that there is currently a large positive styrofoam-pellet forcing because we could undo part of the past warming by dumping pellets in the ocean. The fact that X offers an opportunity to create a negative forcing in the future doesn't mean it's creating a positive forcing in the present. If I were to light a huge lamp pointed at the earth, its climate forcing would be huge, but in your charts it would be zero as there is no annual change. It would show a huge forcing if you calculated forcing from time=0 to time=1. If you waited a bit and then calculated forcing between two points in time with the lamp on at both times, it would show no forcing from the lamp. Which is ... a realistic representation of what's happening, right? Once the lamp is on and staying on, it's no longer forcing a change in climate. That change is now in the past. It's true that at that point you could create a new, negative "lamp forcing" by turning off the lamp and cooling the planet. But you could also create a new, positive "lamp forcing" by adding a second lamp. Leaving things as they are just means ... no forcing. 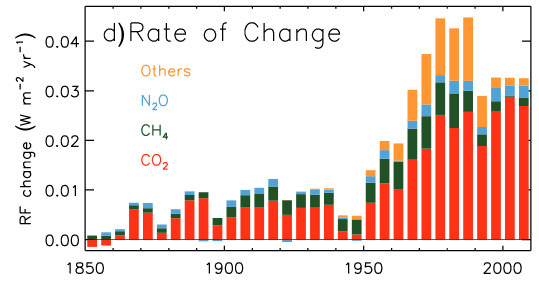 That's an answer to the question "What impact has the change of emissions since 1750 had on the Earth's climate?" Which is a fine question. The IPCC addresses that question, so they show that chart in every AR, in multiple forms. It's just not the same question I'm asking (and answering) here. FWIW, the initial version of my reply to Oren was extremely long and wordy. So naturally I edited it to make it even longer and wordier. And having done that, I want to just pull out one more snippet to comment on. The previous reply is about "science" while this part is about, I dunno, psychology? Culture? especially after a few people felt that the discussion was minimizing CH4. From my perspective, there is a weird "local culture" thing here on ASIF where methane is held in particular respect, and anything that feels critical of methane ... sort of offends people. To an outsider it almost feels kind of Trumpian -- if methane is important it needs to be THE BIGGEST! and if you say anything that makes methane seem "not big" then you're dissing methane. So in my case, for example, I believe in AGW. I agree that methane forcing was big in the past (the mid-20th century) and agree that it might be big again in the future. But that's not enough. If I add "But right now, methane forcing is pretty low compared to CO2, and I think it will take a couple decades for that to turn around" people start yelling and throwing stuff. I don't know why this is. Methane is just part of the AGW problem and Arctic methane is just a smaller part of the methane part. But it's kind of the "local hero" here and people don't take kindly to anyone disrespecting it. Re: "people start yelling and throwing stuff. " The attached image makes it clear that thru 2017 the net CO2 emissions matched the Rapid Growth rate scenario SSP5 being used in CMIP6. One would think that if policymakers took CO2 emissions seriously we would not be tracking the highest GHG emissions scenario in CMIP6. Ned, I have followed your explanations dilligently throughout this thread, but here I strongly beg to differ, both regarding CH4 and my hypothetical lamp. The Earth system has great inertia and a slow response time. A new large forcing appearing today, even were it to remain constant, would affect the climate for decades or even centuries, until the climate reached a new equilibrium. When I see how dismissive you are of this hypothetical new lamp, I understand how thinking only in terms of delta-RF from year to year might blind someone to the effects of unchanging but above-equilibrium RF that continues for a long time. Yes the actual forcing will get smaller over time as the Earth warms in response, and yes it will be difficult to calculate the warming effect, but to say it doesn't matter because the RF is constant and therefore this year's RF is zero strikes me as very unscientific. IMHO 1750-present does matter a whole lot, unless you claim the Earth is in current equilibrium with the 1750-2016 RF, which I am certain it is not despite being unable to calculate it with any precision. Extract: "For example, achieving and maintaining net-zero CO2-equivalent emissions calculated with GWP100—adopted for the implementation of the Kyoto Protocol and in UNFCCC reporting—would result in a peak and decline in global temperature and a cooling effect, with the rate of cooling dependent on the contribution of SLCFs to the overall CO2-equivalent emissions. Adopting a different usage of this metric, here denoted by GWP*, would result in global temperatures remaining approximately constant once net-zero CO2-equivalent emissions are achieved and maintained. Policymakers should be aware of these particularities and determine which metric is most appropriate in the context of the goals of the Paris Agreement." Note that for each of the SSP families (1-5) there are multiple pathways. I believe the three ones that appear to be closest to the actual emissions from 2017 include one pathway from SSP5, one from SSP3, and one from SSP2. In any case, I don't think the graph you posted shows what you're saying it shows. Maybe I'm wrong, though. What do you see in the graph? but here I strongly beg to differ, both regarding CH4 and my hypothetical lamp. The Earth system has great inertia and a slow response time. A new large forcing appearing today, even were it to remain constant, would affect the climate for decades or even centuries, until the climate reached a new equilibrium. Yes, of course. You are referring to "warming in the pipeline", if I understand what you're saying. But that doesn't affect the initial forcing. It's a function of the climate sensitivity, which translates the forcing into a change in temperature. That temperature change is spread out over a long period of time. (1) Turning the lamp on produces a basically instantaneous increase in incoming radiation. (2) This creates a sudden positive climate forcing. (3) Once the lamp is on, assuming its output is constant, there is no further "lamp forcing". Its direct radiative input to the climate system is now fixed and unchanging. (4) Temperature responds much more slowly. Over the next decade or so the planet warms up relatively fast, then the rate of warming tapers off, until at some point (a century or more) it is gradually approaching some kind of equilibrium state, with the planet at a higher temperature than before the lamp was turned on. So in terms of temperature, each year is slowly increasing. In terms of forcing, there is a large forcing when calculating it from before the lamp turns on to after it turns on, but lamp-forcing over any time interval that doesn't include turning the lamp on is 0. (5) As the planet warms up, various positive feedbacks might cause the release of CO2 (e.g., from a warming ocean), CH4, etc. That will cause the atmospheric concentrations of those gases to increase slowly during the century after the lamp is turned on. As we measure the concentrations of those gases increasing in the atmosphere, we would describe them as being additional CO2-forcings and CH4-forcings, even though they're originating from feedbacks that were originally triggered by the lamp-forcing. Pursing that further will cause this to veer into discussion of abundance- vs emission-based forcings, ERFs vs RFs, etc. One reason that climate scientists will stick with the straightforward version of this -- even though it attributes some of the downstream effects of the initial lamp-forcing to an apparent CO2-forcing and CH4-forcing over the following years -- is because disentangling the very long term effects of the various forcings and attributing them to their original causes can only be done using climate models, and that in turn raises all kinds of problematic methodological issues. In the real world, there are usually multiple forcings happening simultaneously (Milankovich, solar, volcanic, anthro CO2, anthro CH4, anthro N2O, etc.). It's a lot more complicated than the lamp case. Dismissive? Au contraire, I like it. I understand how thinking only in terms of delta-RF from year to year might blind someone to the effects of unchanging but above-equilibrium RF that continues for a long time. I would gently encourage you to drop the entire concept of "delta-RF" because it seems to be unhelpful. Every RF is a delta. "unchanging but [positive] RF that continues for a long time" -- This is extremely tricky to talk about, which is why I try so hard to get people to be clear in their language. What you mean by "unchanging but positive RF" is that you are continuously calculating RF relative to time 0, before the lamp turns on. If we think of the lamp as providing 1 W/m2 at the planet, then this would mean that every time you measure it, forcing is 1 (relative to time 0). But every time that you do that calculation, that "1 W/m2" is just telling you what the initial effect of turning on the lamp was. All the actual change in the lamp's radiative input occurred at the start of the time period. Nothing further is happening. Mathematically, physically, and in every sense except perhaps layman-linguistically, this is identical to, e.g., calculating decadal forcings -- which would be 1 W/m2 in the first decade and then 0 in every subsequent decade. Those are, literally, exactly the same thing. The issue of "warming in the pipeline" or "equilibrium climate sensitivity" has nothing to do with the (nonexistent) distinction between these two ways of measuring forcing. Yes the actual forcing will get smaller over time as the Earth warms in response, and yes it will be difficult to calculate the warming effect, but to say it doesn't matter because the RF is constant and therefore this year's RF is zero strikes me as very unscientific. That's very much not what I've been saying. Or it's a mix of bits I would agree with and bits that I wouldn't. Hopefully some of the above makes this clear, but if not ... it won't be easy to be clearer. IMHO 1750-present does matter a whole lot, unless you claim the Earth is in current equilibrium with the 1750-2016 RF, which I am certain it is not despite being unable to calculate it with any precision. I never said the Earth is in equilibrium (I think, and I certainly never would have said that intentionally). There is a distinction between the concept of "forcing" and the concept of "warming". They are connected by climate sensitivity. Warming results from forcing, and it plays out over a long period of time. So past history matters in terms of how much warming is happening now -- it's caused not just by current forcings, but by past ones too. But here we're talking about warming (in kelvins) not radiative forcings (in watts per square meter). What do you see in the graph? Your enlargement makes it clear to me that at the end of 2017 our path was closest to SSP5. If you do not see that, look again. Actually -- the enlargement I posted is not from the same slide as the one you posted. In the one you posted ... all the lines are from SSP5. So I'm not sure how looking at it is supposed to show that 2017 is "closest to SSP5". They're all SSP5. In the graph I posted, all the cases are shown ... but the colors don't reflect which SSP group (1,2,3,4,5) they are, the colors reflect which case within a given group (2.6, 4.5, etc.) they are. The point is, when you show all the cases, and not just the SSP5 ones, 2017 appears to be more or less in the middle of the pack. And if you download the actual SSP emissions data, and go through the painfully complicated process of trying to compare observations to them ... 2017 is basically undistinguishable from a bunch of cases, some of which are from SSP5 but others from SSP2 and SSP3. Plus, it is silly to make a big deal about the emissions at the end of 2017 being close to the center of the scenarios as IPCC keeps re-zeroing each new family of curves each time they are released. If I am allowed to re-zero all the time, all of my projections will be very close a short time later. Great, if it's that easy, why don't you give us the numbers for 2017? Actual emissions, and, say, the three SSP/RCP pathway combinations that are closest to it? I have my doubts that you are a scientist, so I am testing you. Ned, thanks again for the detailed response. I completely understand your clear explanations about RF etc., so please don't feel as if you wasted words or anything. I also realize that the relation of RF to climate policy is far from straightforward, and that when discussing RF it is very important to choose the proper range of years for the problem at hand. so you're saying once more that it does not really matter what is true or makes sense but to be a scientist is what counts. are you aware that you scientists need all the rest of humans who are not scientist do change things to the better? if you understand that (i'm sure you do ) then you should also consider that for many non-scientists it makes a not so good impression if scientists consider themselves as an elite club who disregard and try to deny anything that comes from non-scientists or scientist from other fields of expertise, only because they don't belong to their group. this group dynamics are vastly responsible for most if not everything that went and goes wrong in human history. the analysis of human behaviour is another science than the one about climate and weather but believe me, the impact of human behaviour is root cause while climate change is only on of the many negative effects from it. however, to cut this short, only what is said and after that only what is done counts, not the background while of course the correct background increases chances to see things well. we should all keep in mind that many brake-through finds and even more so most of the base brake through finds in maths, geometry, astronomy and philosophy have been made by self-educated observers, inventors or whichever terms applies best here. there were no universities that taught geometry to Pythagoras. yes i know, examples always limp but for those who are open for considerations it's mostly clear what is meant. Thanks, Oren. I really appreciated your comments in this thread, as with pretty much all of your comments elsewhere on ASIF. Thank you for the kind words, magnamentis. I think your patience is in better shape than mine, but I will work on it. First, I am an engineer and not a scientist. Second, you, Ned and everyone else on this forum are welcome to express your opinions, so long as I am welcome to express my opinions. Opinions expressed as opinions are good. When opinions are expressed as facts they should be exposed, hopefully by someone with the patience and persistence of Ned. I for one am delighted to have learned a little bit more about separating the wheat from the chaff. I very much enjoy seeing your opinions AbruptSLR. Please don't stop posting them. Magnamentis has expressed several times his opinions about scientists. I enjoy reading what magnamentis has to say. However, as someone who works in the environmental field and deals with experts almost everyday, I don't give his opinions much weight when he tries to downplay the opinions of real scientists. When he attacked Fish the other day it really bothered me but I kept my mouth shut. The first thing I always want to know about an expert is his/her formal education. People can google key words all day long, but nothing beats a good education. Additionally, he is full of it when he says that "the rest of humans" have a say. The courts and the administrative agencies set policy. They would never accept an opinion from someone who was not qualified by education or experience to give that opinion. It would be nice if the rest of humans had a say, but they don't care. They do what the law tells them to do, and the laws are made by the courts and administrative agencies. I know a little bit about this because it is what I do for a living. I should clarify I'm talking about how things work in the US. Things might be different in other parts of the world, but I doubt it. It is also helpful for all of you Trump haters (I'm not a fan either) to know that even though he is president, he can not directly make policy for environmental laws. He can appoint people that support his beliefs, but the rules they make still have to be approved by the courts and/or administrative agencies. The first thing I always want to know about an expert is his/her formal education. Thank you for your thoughtful words. Good judgement requires hard work to develop and constant effort to maintain. Personally, I have been impressed by James Hansen's good judgement; and hopefully policymakers will take his advice to heart before it is too late to avoid too severe of consequences. Extract from AR5: "The RF attributed to methane emissions is very likely to be much larger (~1.0 W m–2) than that attributed to methane concentration increases (~0.5 W m–2) as concentration changes result from the partially offsetting impact of emissions of multiple species and subsequent chemical reactions." Edit, for your information I have a BS, MEng & PhD all from UC Berkeley. PhD from Berkeley in engineering! I knew you were smart! Keep posting! We need more people like you on these forums! I'm not smart enough to debate over the RF factors. I know that for a fact. That is why I like to see you guys carry on the discussion because I can learn from you. Thank you for all of your great posts on this forum! Title: "Global LNG Outlook 2018"
Extract: "“Global imports of LNG will set a new record this year on the back of 7.2% growth. A further surge in demand to 2030 will be driven by environmental measures in China, rising power generation in South and Southeast Asia, and a reduction in domestic gas production in Europe.”"
Title: "How The EPA And New York Times Are Getting Methane All Wrong"
As of July, EPA’s own web page “Understanding Global Warming Potentials,” stated, “Methane (CH4) is estimated to have a GWP of 28–36 over 100 years.”"
Extract: "CH4 oxidation leads to enhanced formation of ozone in the troposphere and lower stratosphere through a sequence of reactions involving NOx compounds." Abstract: "Lakes and ponds are important natural sources of the potent greenhouse gas methane (CH4), with small shallow waters identified as particular hotspots. 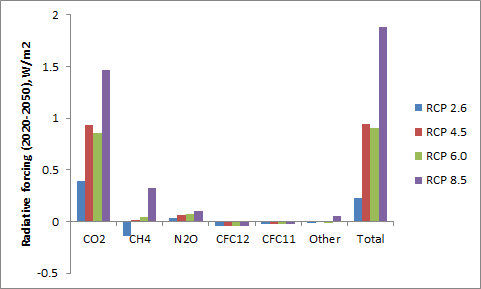 Ebullition (bubbles) of CH4 makes up a large proportion of total CH4 flux. However, difficulty measuring such episodic events5 makes prediction of how ebullition responds to nutrient enrichment and rising temperatures challenging. Here, the world’s longest running, mesocosm-based, shallow lake climate change experiment was used to investigate how the combination of warming and eutrophication (that is, nutrient enrichment) affects CH4 ebullition. Eutrophication without heating increased the relative contribution of ebullition from 51% to 75%. More strikingly the combination of nutrient enrichment and experimental warming treatments of +2–3 °C and +4–5 °C had a synergistic effect, increasing mean annual ebullition by at least 1900 mg CH4-C m−2 yr−1. In contrast, diffusive flux showed no response to eutrophication and only a small increase at higher temperatures (average 63 mg CH4–C m−2 yr−1). As shallow lakes are the most common lake type globally, abundant in highly climate sensitive regions and most vulnerable to eutrophication, these results suggest their current and future contributions to atmospheric CH4 concentrations may be significantly underestimated." See also, Title: "Combined nutrients and warming massively increase methane emissions from lakes"
Title: "US emissions of methane – a potent greenhouse gas – are 60% higher than EPA thinks"
Extract: "The U.S. oil and gas industry emits 13 million metric tons of methane from its operations each year – nearly 60 percent more than currently estimated by the Environmental Protection Agency, a new study in the journal Science finds." Title: "Trump Administration Wants to Make It Easier to Release Methane Into Air"
Extract: "The Trump administration, taking its third major step this year to roll back federal efforts to fight climate change, is preparing to make it significantly easier for energy companies to release methane into the atmosphere. The Environmental Protection Agency, perhaps as soon as this week, plans to make public a proposal to weaken an Obama-era requirement that companies monitor and repair methane leaks, according to documents reviewed by The New York Times. In a related move, the Interior Department is also expected in coming days to release its final version of a draft rule, proposed in February, that essentially repeals a restriction on the intentional venting and “flaring,” or burning, of methane from drilling operations." Title: "Greenhouse gases from rice paddies may be 2x higher than thought"
Extract: "The way some irrigated rice paddies are managed worldwide, with cycles of flooding followed by dry periods, may lead to twice the planet-warming greenhouse gas pollution as previously thought, researchers said Monday. "When this new information is extrapolated across the world and embedded into estimates of methane emissions, the net climate impact from both methane and nitrous oxide could be two times higher than previous estimates," Kritee said." TeaPotty, while ASLR's post is informative, yours is not. I'm not sure whom you are attacking but it's the wrong tone for this forum IMHO. If the amount of methane, nitrous oxides, whatever are so much higher than reported, how come that is not showing up in the NOAA data? (I am unwilling to accept conspiracy theories - Trumpistan hasn't had time to screw that up yet, and the record to date is in the public domain). I thought about Arctic methane - very few measuring stations in the arctic, but these gases only take a few months for world-wide mixing. So I have been unable to find anything that contradicts the NOAA data. Will these non-CO2 gases increase in the future? My guess is yes. Will the models used for the IPCC reports under-estimate these emissions? My guess is yes. But Ned W was not talking about the future. He was talking about now. So unless you have some data (totally lacking in your post) to show NOAA's data is wrong, Ned W is right about the situation as at now. Evidence, please, on measurements taken of greenhouse gases in the atmosphere, now and previous years. AR5 explicitly states that policy decisions on CO2, CH4 and N20 should be based on an emissions basis rather than on an atmospheric concentration basis. As scientists do not need to come to this thread for guidance on how to run their climate models using atmospheric gas concentrations, I suggest than anyone reading this thread does so in order to better understand how to better address climate change; which per AR5 means considering radiative forcing on and emissions basis. I for one have clearly demonstrated that methane emissions generate ozone, water vapor and carbon dioxide which clearly increase the GWP* of methane well above GWP. While it is true that on an atmospheric concentration basis that CO2 presently generates much greater radiative forcing than does methane; on an emissions basis over the coming two decades methane generates comparable radiative forcing to that of carbon dioxide. Edit 1, if this thread is only about radiative forcing from atmospheric concentration, then the title should be changed, otherwise Figure 8-32 from AR5 presenting GWP for 2008 emissions for both 10-year and 20-year periods is relevant to my last point. Edit 2, if it is note clear to some readers, advanced Earth Systems Models include math that account for the chemical reactions of methane in the atmosphere that generate ozone, stratospheric water vapor and carbon dioxide; which generate radiative forcings that NOAA does not attribute to methane because NOAA reports radiative forcing on an atmospheric concentration basis; while report on an emissions basis would attribute these radiative forcing contributions to the emitted methane that generated them. Title: "Devastating termite infestations threaten more damage in the wake of post-hurricane floods"
Title: "Methane Sources – Termites"
Extract: "Each termite produces, on average, about half a microgram of methane per day, a seemingly insignificant amount. However, when this is multiplied up by the world population of termites, global methane emission from this source is estimated to be about 20 million tonnes each year. There are more than 2000 different species of termites and the amounts of methane produced varies considerably between species, with some producing no methane at all. Methane is produced in termite guts, by symbiotic bacteria and protozoa, during food digestion. Termite methane does not always end up going straight into the atmosphere, many species are subterranean or live in above ground earth mounds where much of the methane can be used up by soil methanotrophs before it gets out into the atmosphere." Hmm, I thought this thread was dead when I made my first comment but here's my first thought when it was started: The how is the what. How a thing arises tells you all about what that thing is. This thread was started in order to look at quantitative comparisons of the radiative forcing from CO2, CH4, and N2O. That is exactly what I think you should have done and left your impressions out of it. You never get an impression of those who don't participate. AR5 explicitly states that policy decisions on CO2, CH4 and N20 should be based on an emissions basis rather than on an atmospheric concentration basis. We have already had this argument, and it annoyed the rest of ASIF no end. So I won't repeat myself, and won't be drawn in to another endless back-and-forth. This was my response the first time you made that claim, so anyone who cares can re-read it. AR5 is absolutely 100% clear that both concentration-based and emissions-based forcings are valid metrics for their own purposes. In general AR5 uses concentration-based forcings for science and emissions-based forcings for policy. This topic area on ASIF is labeled Science. If you do not want to see concentration-based forcings -- which are almost universal in discussions among climate scientists -- you should start your own thread in the Policy section of ASIF. I am still pretty pissed off about what happened in the first four pages of this thread and am not in the mood to repeat the experience. So, seriously, I would request that you start your own thread over in the Policy area and post to your heart's content there. 1. When anthropogenic methane is emitted into the atmosphere it initiates a chain reaction of chemical interactions that not only consumes hydroxyl ions but also generate ozone, stratospheric water vapor and carbon dioxide, all of which generate radiative forcing that would not have occurred if the methane had never been emitted. 2. Reductions in the atmospheric hydroxyl ions (which can occur due to a large short-term pulse of methane emissions) slows down the rate of the chemical chain reactions cited in my first point; which then extends the average residency life of methane in the atmosphere, which results in more radiative forcing. Shindell, D.T., Faluvegi, G., Koch, D.M., Schmidt, G.A., Unger, N., and Bauer S.E. (2009), "Improved Attribution of Climate Forcing to Emissions" Science, Vol. 326 no. 5953 pp. 716-718, DOI: 10.1126/science.1174760. Also I note that the linked reference (with an open access pdf) emphasizes our current poor understanding of the current and future atmospheric compositions with regard to ozone and hydroxyl ions as emphasized by the following extract showing that the hydroxyl driven lifetime for methane predicted by different models differ by a factor of 2 (which is not very reassuring). Extract: "The oxidation capacity of the atmosphere remains poorly characterised in a number of environmentally sensitive regions, with an order of magnitude difference between measurements and models. Both measurements and our understanding of the key chemical processes have large uncertainties. One example of this lack of understanding is the uncertainty in future methane concentrations, with models predicting •OH driven lifetimes that differ by a factor of 2." Abstract: "UV radiation is an essential driver for the formation of photochemical smog, which includes ground-level ozone and particulate matter (PM). Recent analyses support earlier work showing that poor outdoor air quality is a major environmental hazard as well as quantifying health effects on regional and global scales more accurately. Greater exposure to these pollutants has been linked to increased risks of cardiovascular and respiratory diseases in humans and is associated globally with several million premature deaths per year. Ozone also has adverse effects on yields of crops, leading to loss of billions of US dollars each year. These detrimental effects also may alter biological diversity and affect the function of natural ecosystems. Future air quality will depend mostly on changes in emission of pollutants and their precursors, but changes in UV radiation and climate will contribute as well. Significant reductions in emissions, mainly from the energy and transportation sectors, have already led to improved air quality in many locations. Air quality will continue to improve in those cities/states that can afford controls, and worsen where the regulatory infrastructure is not available. Future changes in UV radiation and climate will alter the rates of formation of ground-level ozone and photochemically-generated particulate matter and must be considered in predictions of air quality. The decrease in UV radiation associated with recovery of stratospheric ozone will, according to recent global atmospheric model simulations, lead to increases in ground-level ozone at most locations. If correct, this will add significantly to future ground-level ozone trends. However, the spatial resolution of these global models is insufficient to inform policy at this time, especially for urban areas. UV radiation affects the atmospheric concentration of hydroxyl radicals, ˙OH, which are responsible for the self-cleaning of the atmosphere. Recent measurements confirm that, on a local scale, ˙OH radicals respond rapidly to changes in UV radiation. However, on large (global) scales, models differ in their predictions by nearly a factor of two, with consequent uncertainties for estimating the atmospheric lifetime and concentrations of key greenhouse gases and air pollutants. Projections of future climate need to consider these uncertainties. No new negative environmental effects of substitutes for ozone depleting substances or their breakdown-products have been identified. However, some substitutes for the ozone depleting substances will continue to contribute to global climate change if concentrations rise above current levels." Matthew Rigby et al. (2017), "Role of atmospheric oxidation in recent methane growth", PNAS, Vol. 114, No. 21, pp 5373-5377. Extract: "We find a 64–70% probability that a decline in OH has contributed to the post-2007 methane rise. Here, we show that changes in the major methane sink, the hydroxyl radical, have likely played a substantial role in the global methane growth rate. This work has significant implications for our understanding of the methane budget, which is important if we are to better predict future changes in this potent greenhouse gas and effectively mitigate enhanced radiative forcing caused by anthropogenic emissions. " 1. When anthropogenic methane is emitted into the atmosphere it ... generate ozone, stratospheric water vapor and carbon dioxide, all of which generate radiative forcing that would not have occurred if the methane had never been emitted. That's true. But let's quantify it, please, so people reading this understand how important (or not) the effect is. 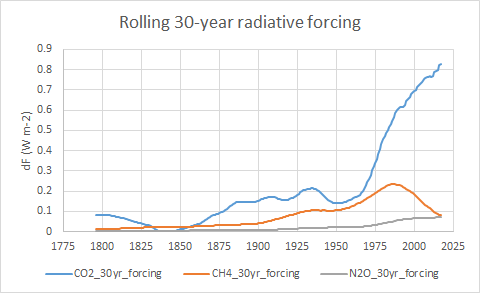 Over, say, the past two decades, do you think the radiative forcing from the methane-derived fractions of those three factors adds up to ... 1% of the forcing from CO2 during the same time period? 2%? More? Less? When doing that calculation, remember that methane is measured in ppb while CO2 is in ppm. GWP is computationally irrelevant to the radiative forcing values shown here. You could use a 50 year GWP of 1 or 100 for methane, and it would not change any of the graphs I've posted. Note the relative size of the green bar, which is the methane forcing. 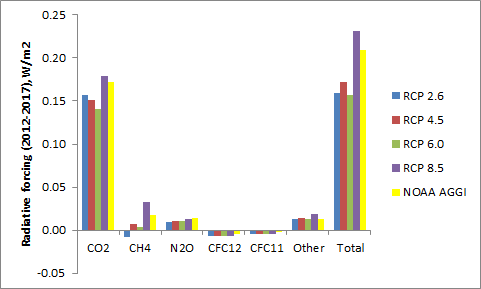 The CH4-to-ozone, CH4-to-strat-H2O, and CH4-to-CO2 forcings would be significantly smaller than the green bar itself. Extract: "We find a 64–70% probability that a decline in OH has contributed to the post-2007 methane rise." In recent decades, the methane forcing has been extremely small. Indeed. But not because nothing happened with methane. Rather methane emissions were almost cancelled out with atmospheric methane decay. But had there been no methane emissions, we would have had a significant negative methane forcing. Ignoring this dynamic while posting comments that methane is not important due to its stable concentration (and relegating emissions to policy), is I think the reason why this thread is eliciting emotional responses. Humans are increasing CO2 concentrations (visibly affecting RF) and maintaining methane concentrations from dropping (invisibly affecting RF). I think both of these are important. As the focus of this thread is narrowly defined as the RF with a 1 year moving baseline, would you be willing to calculate and present RF resulting from a reduction of 10% in methane concentration over 1 year while all other GHG concentrations remain stable at current levels? (This would occur naturally should humans decide to shift policy and stop emitting GHGs). This RF information could help readers who desire to discuss the relative merits of various policies in the yet-unopened policy thread. Thanks for the comment, Oren. You've brought up this idea before and I'm not sure what to think about it, mainly because I'm not sure what the relative costs and obstacles are for different approaches to reducing the total forcing from greenhouse gases. But you made a very straightforward request, so let's tackle it. We can start with the 2017 NOAA AGGI data on atmospheric concentrations for CO2, CH4, and N2O. Assume that CH4 is cut by 10% over some period of time (it actually doesn't matter how long) while CO2 and N2O stay the same. Is that a large amount or a small amount? Depends on how you choose to look at it, I suppose. For comparison, the normal annual increase in CO2 in recent years has created an annual forcing around +0.03 W/m2. So dropping the concentration of methane in the atmosphere by 10% would be equivalent to just under three years' worth of the annual increment in CO2 concentration.